Don't let the title fool you. These aren't literally menswear pieces, although I do encourage you to shop the menswear section from time to time. Rather, this is a menswear INSPIRED look. 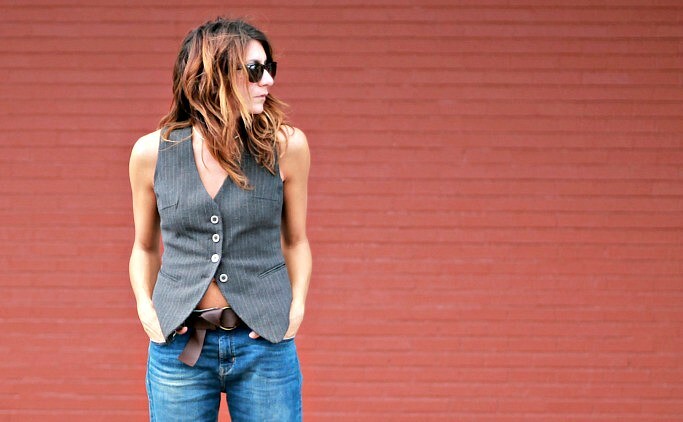 Oddly, both the vest and jeans are from H&M. The vest I've had forever, and it's still one of my favorite pieces. I like to keep the bottom button unbuttoned for an ease, and to add some femininity to the otherwise masculine look. The jeans I bought a couple of sizes big on purpose. The slightly baggy paired with the structure give off a casual vibe without looking sloppy. This entry was posted on Friday, October 10, 2014 and is filed under blue,brown,grey. You can follow any responses to this entry through the RSS 2.0. You can leave a response. Great look, I was rocking a old vest the other day too. Classics eh? Drats!! I had my hand on a menswear vest at my favourite store (Winners) just a few days ago, dear Sheree...and I passed it up!! Wish I had seen this inspirational look of yours beforehand! !